The definition of occult has changed over the years. Shrouded in mysteries and hidden knowledge, the occult has taken on magical properties, several meanings, and many misconceptions. The origin of the word "occult" comes from Latin word "occultus" that means hidden, clandestine, or secret. The occultism definition was used to describe knowledge that was hidden. For someone dubbed an occultist, the word was used to describe their devotion to obtaining a deeper spiritual knowledge and understanding that exists beyond that of the physical world and what science can explain. The early Church attempted to gain power and control over the masses during the vacuum left by the fall of the Roman Empire at the start of the Middle Ages. This was accomplished by condemning anything that wasn't in keeping with the Church's guidelines and practices. While the masses converted, the ancient ways remained cloaked and practiced in secret. The brush stroke that painted occultism as anything outside the scope of Christianity was so broad that everything else was lumped together. Many practices previously considered benign suddenly became dark. Categorized alongside dark magic and other negative ceremonies, anything the church didn't understand that had no known rational explanation was also tossed into the category of occult, including science. While science has since been proven to be not only relevant but necessary, nearly anything that falls under the paranormal umbrella is still considered to be of the occult today. For the modern usage, occultism been relegated to categorize knowledge and practice of the paranormal or supernatural. Since the Middle Ages, the occult definition has been hijacked to describe various mysterious orders and magical groups or organizations. These all have one common denominator: they have a set of practices or rituals. They also teach members about the group's history, and in many instances secret knowledge is shared along with the guiding philosophical spirituality that governs them. Modern occultism remains defined by Christian values. Therefore, occultism refers to those engaged in the study of things considered to be occult. This includes magic, alchemy, psychic abilities, astrology, spiritualism, earth magic (herbalists), and any form of divination. The Complete Evangelism Guidebook defines occultism as a compilation of different groups with beliefs and practices distinct from each other. The belief systems of some groups aren't always aligned with each other and quite often contradict what another group believes and practices. The guidebook divides this vast diversity of occultism into three categories. The guidebook defines this tool of occultism as a way of seeking hidden knowledge, often knowledge about the future through psychic readings and various supernatural means. 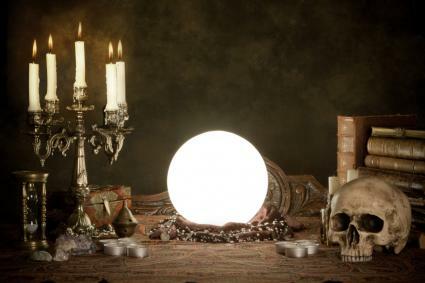 The guide refers to divination tools as "props" that are used in astrology, tarot cards, palm reading, scrying with tea leaves or crystal balls, and other ancient divination tools. Paganism is often referred to as "neo-paganism" to distinguish the growing revival that started in the 19th century of these ancient forms of worship. The 1960s saw another revival of these practices that include animism, the belief that living things contain living spirits. This religion worships ancient deities with the frontrunner being Mother Goddess or Mother Earth (Gaia). Spiritism is often called Spiritualism. It's the belief that the living can communicate with the spirits of those who have died. This is done through the individual's own powers. Trance mediums, channeling, and séances are three ways that mediums can contact the dead. This in an ancient form of occultism found in Greek, Egyptian, Roman, and other cultures. It has remained through modern times. Spiritualism was very prominent during the popularity of séances in the mid-1800s through the 1920s. Over the centuries, the occult was clothed with a veil of evil and sinister misdoings. These became the biggest misconceptions of the true nature of occultism. Science was misunderstood during the Middle Ages and was therefore considered an occult practice by religious people. The science of chemical and elemental interaction between objects and substances simply wasn't understood and therefore, was all magical. Alchemists were considered to be witches or wizards attempting through magic to transform metals and other elements with various unnatural processes. Herbalists were thought to practice earth magic. When natural elements were manipulated and transformed, they were considered objects of the occult. Perhaps the most contradictory aspect of the religious sect versus the occult sect was that both groups believed everything in the world had a touch of magic behind its very existence. There are many religious cults, including Christian ones, that are often confused with occult groups. While many occult groups can also be cults, the distinction isn't always made. This causes many people to believe incorrectly that the two words are interchangeable. This misconception is very damaging to all groups. Another common misconception is that all occultists worship Satan and that the occult is evil with sinister intentions. This incorrect perception can be traced back to the way the Church defined occultism and ancient practices. This stance can be seen as hypocritical, especially when viewed through the writings of The Christian Classics Ethereal Library. "The Christian church… has claimed an uninterrupted succession of miraculous powers, the gift of tongues, of vision, and of prophecy, the power of expelling daemons, of healing the sick, and of raising the dead." By the Church's own definition, these very practices could be considered "occult" and when viewed under the Church's lens of occult definition, this equates to Satanism. In the modern culture, the word occult is still a catchall for many groups and is used favorably or unfavorably, depending on the group. For example, anything non-Christian is often viewed as occult. Many groups dubbed occult have the same mission as those from 1,500 years ago - pilgrims seeking a higher spiritual understanding of the supernatural world and their place in it.